SNK just announced that they are working on a netcode patch. Their brief annoucement confirms our testing that there is a bug affecting netplay connection quality in ranked and free matches, but Party mode is otherwise unaffected. Oda said they aim to have the patch submitted to Sony next week. This is great news for us as SNK is responding to this issue quickly and the netcode so far is nothing but excellent in Party mode. SNK just announced that they are hosting a KOF XIV World Championship in early 2017. Further information will be released on a later date. This will be a huge boon to the KOF community as it signifies SNK’s support for the community. Stay tuned for details! Is Party Mode the Answer to KOF XIV’s Hit-or-Miss Netcode? TL;DR: Netcode is great in party mode; go try it for yourselves! With KOF XIV offically released yesterday, many fans have already hopped online to try out the new netcode. Early reports indicate that the netcode is a hit-or-miss experience. While some reported very good connections, a lot reported slow and sluggish matches with people who are located closeby and have good connections in other games otherwise. The consensus so far seem to be a hit-or-miss experience. When it works, it works very very well. But when it doesn’t, matches are slow and unbearable. What is the root cause of this huge discrepency? The community is quick to figure out potential solutions to the netcode. One promising solution so far is the party mode. For some reasons, the netcode is great in the 3 vs 3 player party mode. Last night, we hosted a lobby with people from the Dreamcanel Discord and played for hours. All of the matches were great and felt very smooth. We have players from around the country including San Diego, NorCal, Illinois, Alabama, New Jersey, Minnesota, Florida in the room. Everyone reported that their matches with one another were excellent in terms of lag and smoothness. In particular, we noticed that the same players who previously had underwhelming connections in free battle mode now have excellent connections in party mode. We checked other settings including switching hosts and are happy to report that they do not seem to affect the experience. Separately, Mad Kof in Korea also experienced the same phenomon. His connections are nothing but smooth in the 3v3 Party Mode. So with these findings, could it mean that there is a bug in the game that hampers online experience in free matches but somehow does not affect Party Mode? Try it out yourselves and let us know how it works for you! SNK just released the second team gameplay trailer. The new trailer shows off Team Yagami, where Iori, Mature, and Vice returned to team up once again in KOFXIV. All three characters have new special moves in KOFXIV. Check out the trailer above. KOF XIV is scheduled to be released on August 23rd in the USA. 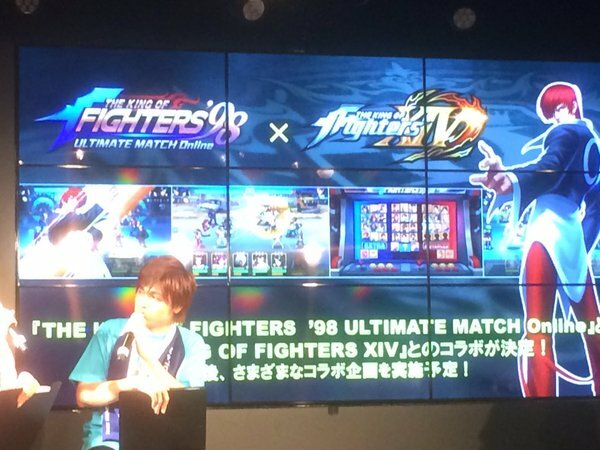 The KOF98 themed mobile game “The King of Fighters 98 ultimate match online” is officially launching in Japan this summer. 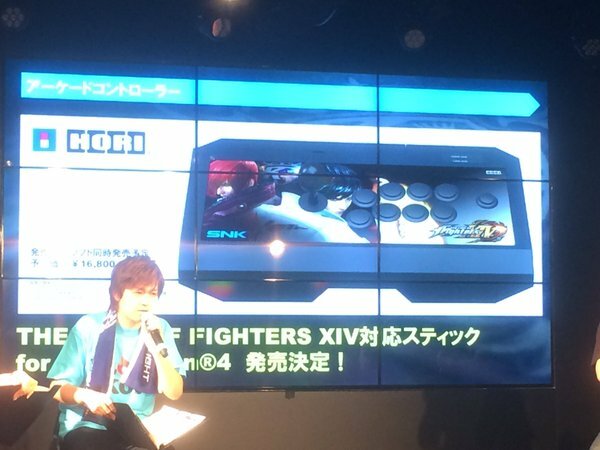 There will be a KOFXIV collaboration event to go with it. KOF98 online is currently available on smartphones in China, Korea, Hong Kong, and Taiwan. It has met with great success, often ranking near the top of app store rankings, and has been pulling in millions of dollars every month in in-app purchases. 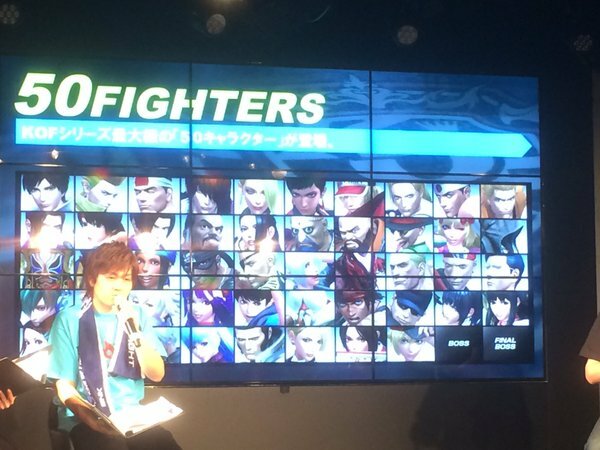 During the KOF XIV event at the e-Sports square in Akihabara, SNK Playmore officially revealed the list of 50 characters in the game. The list confirms the authenticity of the leaked list that has been surfacing around the internet. 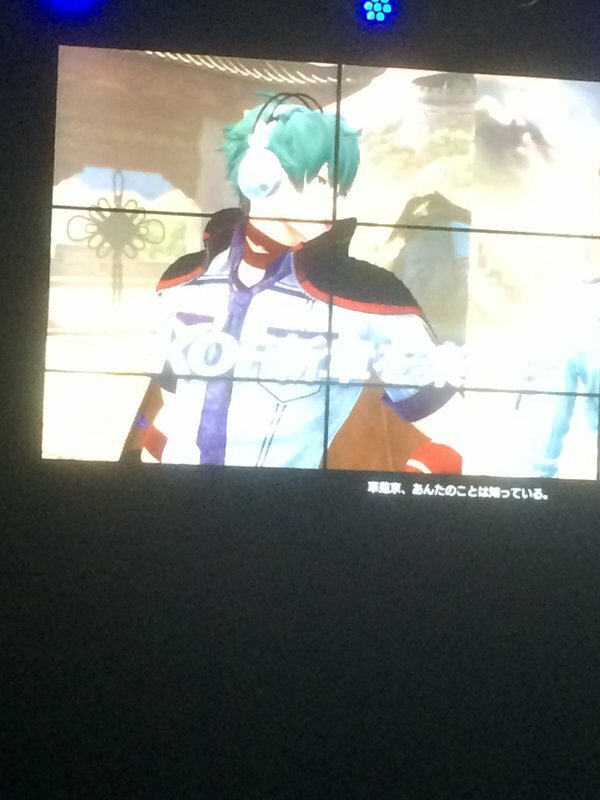 The main character is revealed to be シュンエイ (Shun’ei), who is Tung’s last disciple. The new South American team will be made up of Bandieras, Nelson, and Zarina. 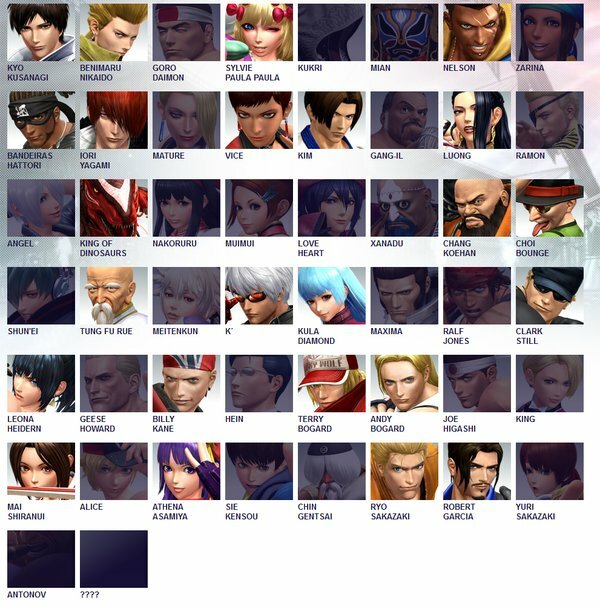 Ramon, Nakoruru, Love Heart, Alice, Yuri are joining the cast. Xanadu will be joining Chang and Choi on the Criminal Team. 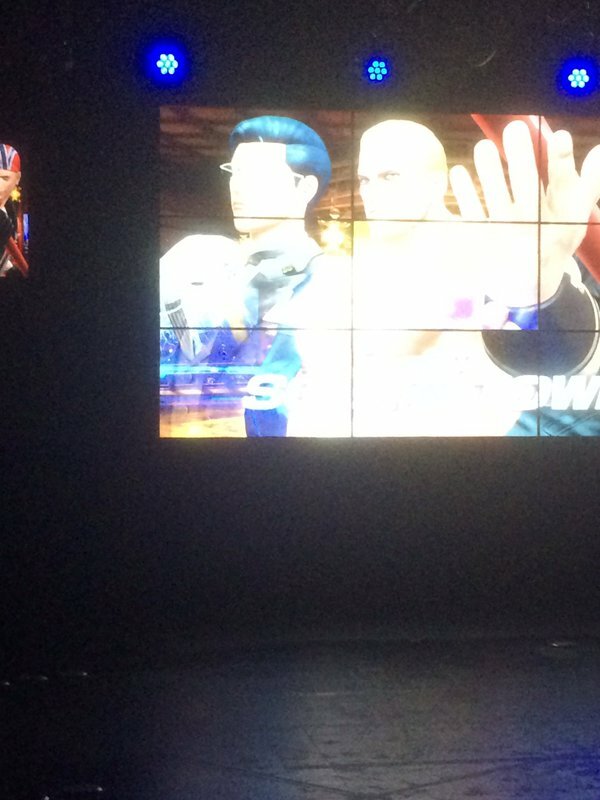 Geese’s team will have a new character named Hein. Kim’s master Gang-Il will be joing team Korea. 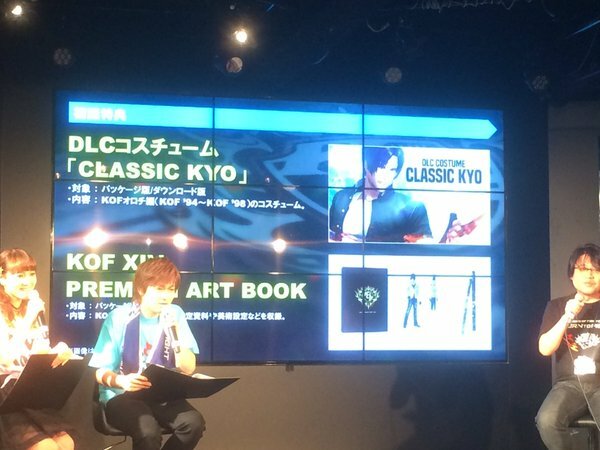 Finally, there will be a Classic Kyo DLC costume, KOF XIV premium art book, and KOF XIV arcade stick to accompany the launch of KOFXIV.